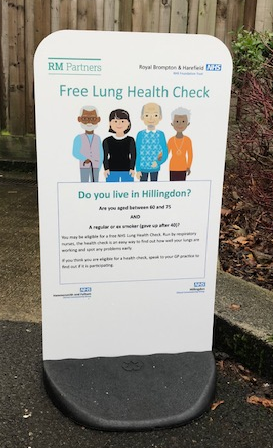 Over 500 people in Hillingdon and Hammersmith and Fulham have already participated in the RM Partners pilot project to help pick up lung cancer earlier. Lung cancer is by far the most common cause of death from cancer in the UK because the majority of people are diagnosed in its late stages. People in the two boroughs who have been identified by participating GP practices as being at high risk are offered a lung health check. The health check is aimed at people aged 60-75 with a history of smoking. The check involves testing for a range of breathing and respiratory conditions and, if appropriate, a CT scan in a convenient place on the same day will be offered. The aim is to diagnose lung cancer at an earlier stage when treatment may be more effective. Those living in Hammersmith and Fulham have their check at the Royal Brompton Hospital, while those from Hillingdon are offered the check in a mobile CT unit based in a supermarket car park. Nicola Hunt, Managing Director at RM Partners, said: ‘This is a fantastic project that we know can have an immediate and significant impact on the early diagnosis and treatment of lung cancer. We are extremely excited to be the first Cancer Alliance in London to offer a mobile service, which gives patients easy access to health checks and CT scans within their local community. The project is running until March 2019. More information on the project is available here.